The 2017 Knaresborough Crag Rat Run, will be held on Sunday 1st October. Entry is via racebest.com at the following link. We look forward to welcoming previous participants back and meeting new entrants taking on the event for the first time. More information on the event, including course map, can be found here. For those registered for the quiz, please arrive for 19:45 so we can start at 20:00. If you haven’t registered for the quiz but would like to take part in the bingo, please arrive for 21:00 for a 21:15 start – the more that come, the bigger the prize pot there will be!! The bar will be open and snacks (crisps, etc.) will be provided on tables in the function room. Our new Social officers (Natalie Hale and Clare Rogers) have arranged a Quiz and Bingo night for Saturday 6th May (20:00 start) @ Knaresborough Cricket Club. It will be teams of 6 for the quiz, with individuals/couples placed in teams as appropriate. 6 teams can be accommodated so get your name down on the sign up sheet at KCC asap! Before our club training night on Tuesday 11th April, we will be joined by representatives from HOKA who will be bringing down their latest shoe offerings, to give you the opportunity to try them out for the whole session. The clubhouse will be open from 7pm, so get down early to make sure you get your size shoe! Three Striders headed up the A1 to Darlington South Park parkrun for the latest club visit. The event is held over 3 laps of the Victorian park, taking in a lake and views of the river. James Wright came across the line in 18:42, followed by Mark Taylor (22:33) and Edna Wood (28:06). At Harrogate, Guy Close led the Striders contingent of six in a time of 18:50. Ian Mitchell dipped under 21 minutes (20:51) and was chased down by Derek Calvert (23:10), Nick Wallen (25:26), Emma Hall (36:05) and Danielle Greenwood (36:52). Over in Leeds at Woodhouse Moor, Rob Earl finished his parkrun in 20:39. Another Leeds area parkrun, Temple Newsam, was visited by Ralph Weldon and Claire (Cloie) Baxter. They finished in 27:49 and 35:17 (PB) respectively. Dawn Richardson was the sole Striders representative at Fountains Abbey and finished the ‘normal’ course in 29:53. David Halladay took on the Druridge Bay parkrun in Northumberland, completing the two lap coastal course in 22:39. On the cliff tops at Sewerby (near Bridlington) Craig Mitchell secured a PB of 24:09. Finishing off the parkrun roundup is Alison Jacksons result of 32:26 at Mornigton Peninsula in New Zealand……not jealous at all! Away from the various parkrun visits on Saturday, the ‘Dales Trails 20’ was taken on by Sean Brennan. This event is the first in a series of three ‘DT’ events throughout the year, with the 20km option taking participants up a total accent of 721m through the Swaledale area. Sean completed the testing course in 02:01:36 to give him some excellent preparation for a ‘little’ race he is doing later in the year…but that we will keep under wraps for now! Our very own ‘Marathon Man’ Graham Yare has been at it again…this time a trail marathon at Temple Newsam which he finished in 04:36:49. He’s doing another two marathons this coming weekend…….!! Moving onto Sunday, Jason Green took on the Lincoln 10k. This race is part of the wider ‘Run for All’ series which includes the Leeds Half Marathon and York 10k. Jason completed the course in a PB time of 40:54. There was a big turnout of Striders at the local Fountains 10k. A total of 16 Striders were in attendance and were led home over the boggy moorland by Martin Brock who came across the line in 40:26. James Wright chased him down (42:00) and Nicola Carter claimed 1st in her age category with a time of 44:32 (taking home a sizable box of wine for her efforts!). Up next was Sima Lowery (46:38 – 3rd in age category) and she was followed over the line by Simon Rider (47:46), Luke Ratcliffe (49:56), Mark Taylor (50:25), Paul Heywood (54:24), Claire Killingworth (54:27), Kez Welsby (57:49), Edna Wood (58:32), June Graham (01:03:35), Katie Gray (01:10:46), Anne Cooley (01:11:29), Emma Greveson (01:12:05) and Jo Gray (01:21:28) – great to see you back running Jo! More photos from the event can be viewed here. A result missed from last week was Sue Morleys visit to Trawden in Lancashire to take on a 13.2km event known as the ‘Boulsworth Bog Fell Race’. Sue completed the course, which includes 425m of climb, in 01:28:21. The club would like to remind all members that membership fees are now due for 17/18 (covering upto 31st March 2018). The options available and links to online registration forms can be found here. It’s going to be anouther fantastic year at the club, so get yourself signed up and take part! Spring has certainly sprung, with glorious weather greeting all of the Striders who were out and about at events this weekend. The Stray was certainly a lot drier then recent weeks and coupled with the sunny weather, a record attendance of 447 was seen at Harrogate parkrun. Guy Close was the first Strider back (18:34) and he was joined by Nicola Carter (21:12), Ian Mitchell (21:26), Andy Roberts (23:50), Paul Heywood (25:03), Rob Charlesworth (27:20), David Halladay (27:42), Eric Morley (28:05), Edna Wood (28:30), Claire Baxter (35:21 – PB), Danielle Greenwood (36:12 – PB), Lauren Downs (37:26 – PB) and completing her first parkrun, Becky Kershaw recorded a time of 40:10. The revised route at Fountains Abbey was still in place on Saturday with Tom Calvert completing the course in 18:30. Sean Brennan was next Strider back in 22:06 and was followed by a PBing Niamh Falconer (22:31), Derek Calvert 23:57, Fiona Slight (29:33 – PB) and first time Fountains visitors Jackie Knight (35:46) & Libby Brennan (35:47). Mark Taylor headed down South to the Rutland Water parkrun and was on course for an overall parkrun PB….but unfortunately the course had been measured incorrectly (2.6miles out of the 3.1miles required). He recorded 18:22 for the distance on the day – a great run Mark and that overall parkrun PB is on the cards in the next few weeks! James Cornforth looked strong from the start, taking the many undulations of the course in his stride to finish in 01:33:35. James Wright continued his Rotterdam Marathon taper with a time of 01:38:44 and was chased down by the other members of the Cornforth family members in attendance – Philip securing a time of 01:50:03 and Anna finishing in 02:12:55. Sunday….a day of rest…..not for Striders! The good weather continued on Sunday for two more events – the Keighley 10k and the Ripon Hornblower Duathlon. At the ‘Big Keighley 10k’, Simon Rider stopped the clock on 47:41 to secure an overall 10k personal best. Three Striders took on the new duathlon event in Ripon, with Tom Calvert leading the way in a time of approximately 01:22:00 (awaiting his official time at the time of writing!). The event, which consisted of a 5k run, 24k bike and a 3km run to finish off, was also taken on by Nicola Carter (01:36:57) and new Striders member Craig Mitchell (01:40:59). We are visiting Darlington South parkrun this Saturday (01/04) for our April ‘1st Saturday of the month’ parkrun visit. Information on the course can be found here – here. Meet at KCC for 07:35 for a 07:40 departure. Details for all of our 2017 parkrun visits can be found on our website via this link. Our first time trial of 2017 takes place on Tuesday night (28/03/17). For those that have not participated in one of our TT’s before, it entails a 5km(ish) course based of two laps through the Aspin estate. They are informal events and designed to help you set a time that you can then improve upon at the July and September TT’s. The event is free but for time taking purposes we do ask you to wear a race number. With this in mind, please arrive at the club earlier then usual to register. Numbers will be available from 19:10 at the clubhouse and we start approximately 150m down the road (right out of the KCC gates). After you have completed the two lap course, join us back at the clubhouse well deserved cake that Clare McKenzie will be selling as part of her London Marathon charity fundraising. 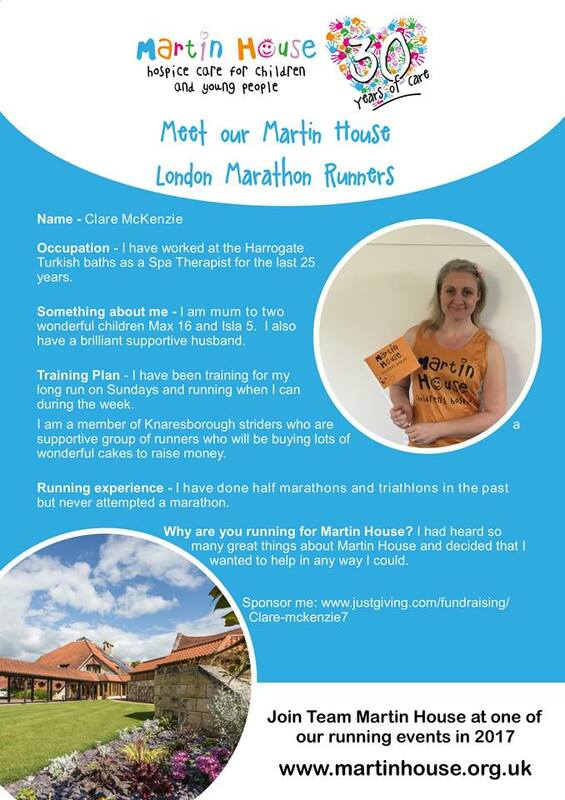 Clare is running the 26.2miles of the world famous marathon for Martin House Childrens Hospice – a very worthwhile cause. There will also be a raffle where you will have the opportunity to win some fantastic prizes! Her fundraising page can be found here. We start our latest results round-up with some finishing times missing from last week. Jason Green took on the ‘Mighty Deerstalker’ obstacle challenge in Scotland. The description on the event website states “This is probably the hardest off-road-Tweed-clad-pipe-lit-plus-four-and-headtorch-wearing run that exists. We send you across rivers, through forests and over a mountain or 2 in the pitch dark of a chilly March night.” Jason competed well, finishing in a time of 02:00:12 – top work Mr Green! At the last event of the PECO Cross Country series, Nicola Carter was part of her age group representative team, completing the 2nd leg of 3 in a time of 24:19. Striders had two relay teams entered in the event with first team back been made up of Claire Killingworth (34:40), Jez Wilkinson (27:36) and James Ireland (22:16). 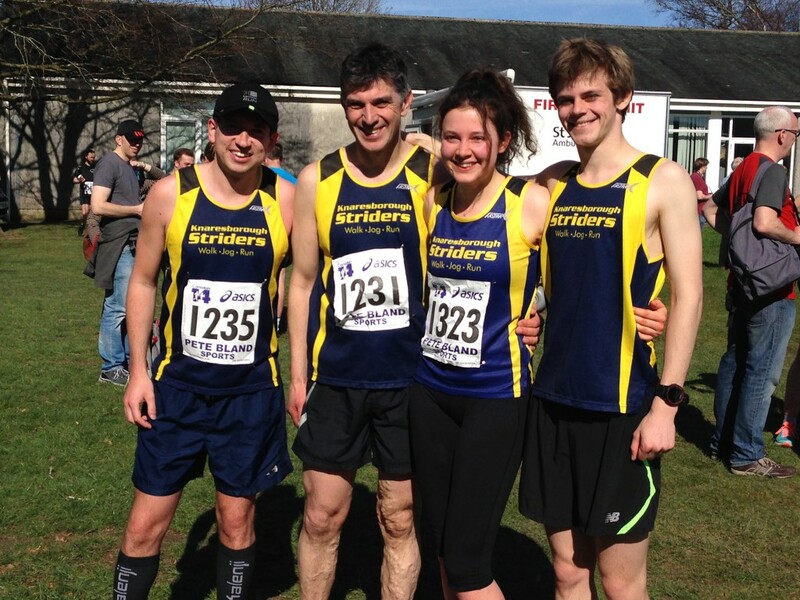 The 2nd Striders team consisted of Sue Morley (32:38), Charlotte Hines (34:46) and Sam Keen (29:27). Well done to all those that competed in a PECO XC event during the 16/17 series….only 8 months until it starts again! Moving onto this past weekend, at Harrogate parkrun Ian Mitchell was the first Strider back (21:53) and he was joined by Gareth Conkleton (23:03), Nick Wallen (25:27), a PBing Kirsty Jones (32:32) and Emma Hall 37:51. Two of our recent Zero to Hero graduates made the trip over to Roundhay Park in Leeds for their parkrun fix. Claire Baxter and Annika Mcdonald ran the course together to finish in 40:24 and 40:25 respectively. On the revised course at Fountains Abbey Rob Earl led the way for the club in a time of 20:20. The other Striders taking on the National Trust venue course all achieved Personal Bests so a BIG well done to Fiona Slight (31:08), Danielle Greenwood (37:37) and Lauren Downs (38:16). Local parkrun ambassador (although he tells me that he doesn’t carry a tray of Ferrero Rocher around with him – how disappointing!) 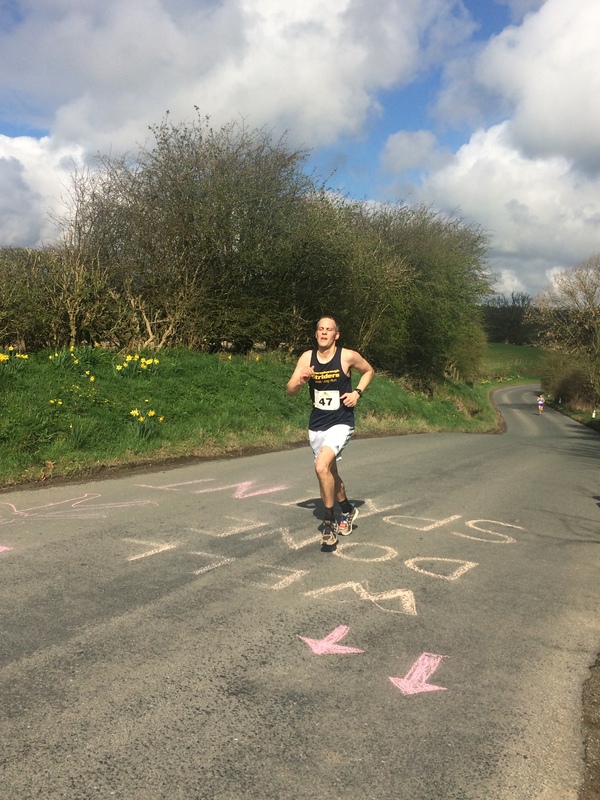 Sean Brennan took on the Catton event whilst visiting the Norfolk area, finishing in a time of 21:17. A little bit further afield….ok quite a fair bit further afield…Alison Jackson visited the Western Springs parkrun in New Zealand. The Auckland based parkrun was completed by Alison in 34:27. Jason Green competed in his second obstacle course event in as many weeks by visiting Bramham Park for the Major Series on Saturday. Jason finished in 59:03 to take 5th place overall. 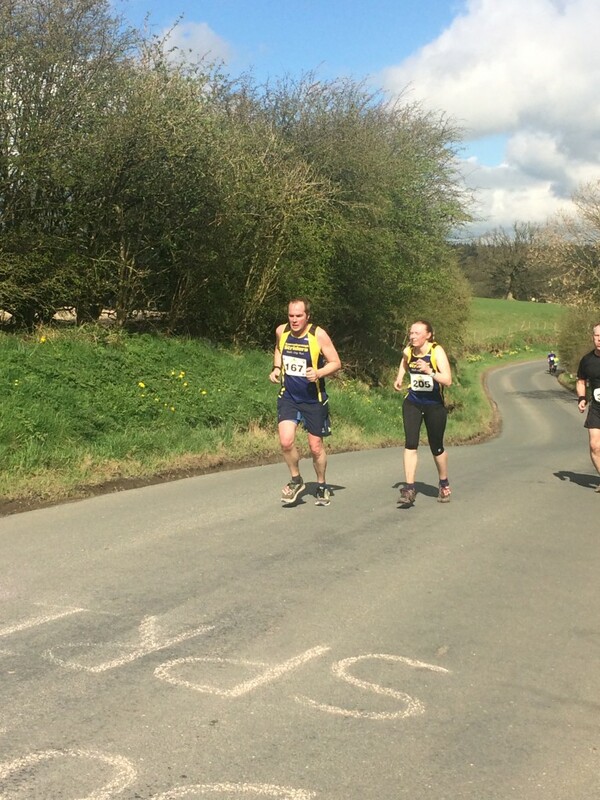 Graham Yare continued his epic running challenges by completing the Hardmoors 55 Ultra event on Saturday. This race takes particpants from Helmsley to Guisborough along the Cleaveland Way. He finished the gruelling event in 13:25:02 (and in doing so complete his 52nd marathon) – massive kudos to you Graham! 17 Knaresborough Striders made the trip to Thirsk on Sunday for the annual 10 mile, which this year also formed the first event in the club’s championship calendar. James Cornforth ran a very well-paced race to finish in 82nd overall in a big PB of 01:03:48. Martin Brock was next Strider home in 01:05:38, closely followed by James Ireland (01:05:54). Dan Foley (01:11:21) was next home, just over a minute ahead of first Striders lady Nicola Carter (01:12:34), with next lady Sima Lowery (01:14:17) also dipping under the 75 minute mark. Philip Cornforth (01:15:19) was next back with David Halladay (01:19:03) also breaking the 80 minute barrier. Paul Heywood (01:26:16) and Claire Killingworth (01:26:17) were separated by just one second. Anna Cornforth (01:31:11) led the remaining Striders home, all of whom broke the 1hr40 mark, with other finishers being Fiona Slight (01:35:15), Edna Wood (01:37:14), Dawn Richardson (01:38:16), Laura Baker (01:38:30), Roy Cooley (01:39:38) and Mark Shelton (01:39:38). Well done to all who completed the race on what was a very windy day. A few more to finish off.. Meanwhile, James Wright travelled to Humberside to continue his training for the Rotterdam marathon by competing in the East Hull 20 mile event, running well to finish in 02:25:32. 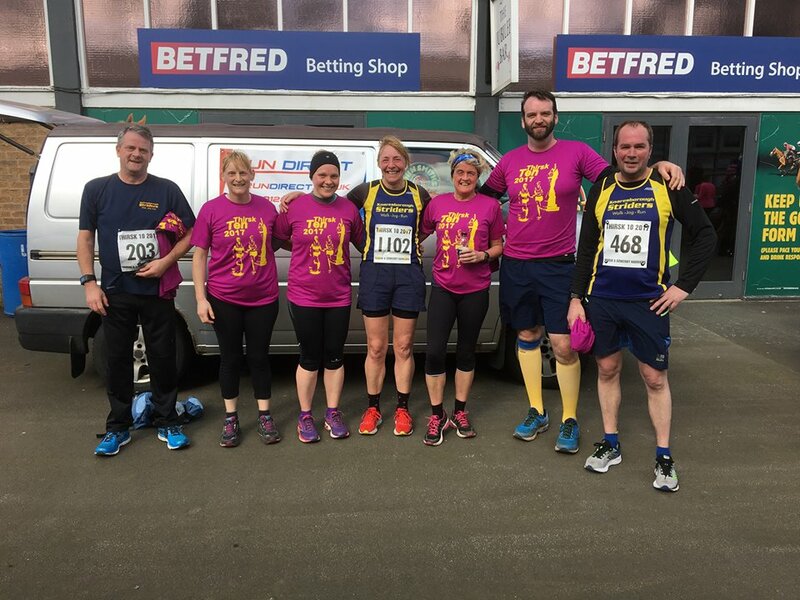 And the Striders were also represented at Bradford’s 10k. A strong run from Guy Close saw him finish in 18th place from over 1,700 finishers in 37:54, while Mark Taylor came home in 45:18.